Cyclone Nygris made landfall in Burma on May 2, 2008, and the devastation that it caused cannot be put into words. The official death toll was 138,300, yet experts believe that the number is actually much higher than was reported by the Burmese government. Emma Larkin, a journalist who had spent time secretly reporting in Burma in the past, managed to secure a visa for herself shortly after the cyclone hit, and arrived ready to help those in need while chronicling the destruction the cyclone left behind. 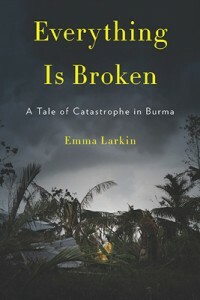 Everything is Broken is Larkin’s account of the events in Burma before and after the cyclone, and in it she reveals details about the complex military dictatorship that rules this country, and the bizarre, horrifying ways the regime in Burma responded to the cyclone and its effects on their country and its people. Before reading Everything is Broken, I knew next to nothing about the country of Burma. I’m ashamed to admit that I don’t even recall hearing about Cyclone Nygris when it happened. Which is why it was a good thing for me to have the opportunity to read this book – I learned a lot, and it made me sad that I was not aware of any of this before. Everything is Broken is not a book one can really enjoy reading. In fact, I read it with a mixture of fascination, shock, and horror. The complete havoc that the cyclone inflicted upon the people of Burma is something I cannot wrap my brain around. And the fact that the Burmese regime refused to accept any outside help for its citizens quite frankly made me sick to my stomach. Reading about how people had lost their entire families, homes, businesses, everything, and yet the government literally did nothing to help, well there are just no words to describe the feelings it brought forth in me. But I do think the book was written very well – that is, Larkin took this country that most people know little about, and this event that was brushed over in the national media, and illuminated everything for the reader. She brought it to life for me, she made me understand the hardships these people had faced and will continue to face in the coming years, and she made me understand what is so heartbreaking about it all. It was clear that Larkin knew the country of Burma well, and that she has a deep love and admiration for its people. In addition to her reporting about the cyclone, Larkin spends a portion in the middle of the book explaining the history of Burma’s government, telling the reader a bit about the regime and about the atrocities committed by it over the years. She fully admits that it is difficult to gain access to any real information about the government, so what she reports is the truth as best as she was able to get it. After reading Everything is Broken, I plan to read Larkin’s first book, Finding George Orwell in Burma, which is more about the history of the country than about one specific event. When I closed Everything is Broken for the last time, I was left feeling unsettled. Larkin is not able to provide any answers or solutions to the immense difficulties that Burmese citizens face on a daily basis. It is difficult to read a nonfiction book and not feel some sense of hope at the end. But my feelings upon completion of the book are nothing compared to the terrifying and heartbreaking lives the people of Burma are resigned to. For that, I am grateful I read this book because I needed to know more about this country and what its people have been through. Emma Larkin did an outstanding job illuminating this country for me, and I highly recommend reading Everything is Broken to learn about Burma for yourself. I didn’t read your review yet because I am touring this book next week (I try not to read reviews until I’ve written my own)…but I just wanted to stop in and say I am more than 1/2 way through the book and can’t put it down. It is like watching a train wreck – you don’t want to see it, but you can’t stop looking. I am finding Larkin’s writing to be riveting. I ran over to my library’s site after reading your review & put this one on hold, so I hope it arrives soon! I’m about half way through this and having a hard time with it. I am learning a lot but I’m just not reaching the point where I feel compelled to keep reading. Maybe because I know it won’t end well. Aw, well I hope you do finish it! Nonfiction can be tough to get through, especially when it’s as sad as this one is. Good luck! I hadn’t heard of this disaster before hearing about this book either – and that is a true shame. It sound like it is definitely worth reading even though it isn’t exactly pleasant. Thanks for being part of the tour. One of my friend recommended this book, then I search for more reviews and reach here. I’ll definitely buy this book and the other book too. Very much thanks for the review, especially for your feeling about my people. And thanks to the people who commented here. I just returned from a weekend “vacation” to Yangon. I am someone who likes to see things for myself. I am now reading Everything is Broken and I can not tell you how it makes my heart break after having met and talked to local people there. If you are not familiar with Burma and it’s recent history, I would urge you to read this book and anything else you can get your hands on. It is a sad sad story and needs international attention.